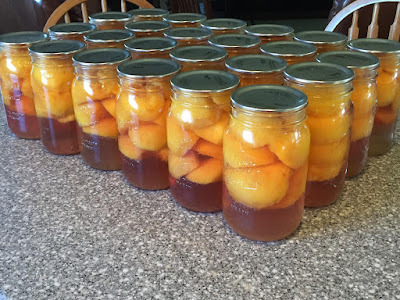 A few years ago as I sat 'frantically' at the sink - trying to get my peaches bottled I heard a little voice telling me to 'slow down and ENJOY these peaches'. It was something I'd never thought of before and I knew it's divine Source. So, I suddenly stopped my hurry and worry of 'getting them done quickly' and....took the time to enjoy the moment. Each peach seemed to say to me 'here I am, I'm here for you. Enjoy what I am offering you.' It was a sweet and tender experience as they seemed to come to life - teaching me that their purpose of creation was being filled in their ability to be used by me and my loved ones. I've often thought of that experience which, to me, was sacred, and a life-long lesson of all of the incredible things God has blessed us with to feed, nourish, nurture, and strengthen our bodies and souls. If we take the time to stop and remember their Source and their purpose we find much greater JOY! At least, that's been my experience. So, this year as I bottled, I remembered that lesson and I took the time to find joy and enjoyment in these sweet little offerings. And, I appreciated all those who took the time to plant the trees, nurture them, water and care for them, prune them, and then...harvest them. Many are involved in this life-giving process and I have become much more grateful, thanks to the teachings of One who took the time to remind me of an important life lesson and of the purpose for all He has done for us. If you're interested - you can also check out my PREPAREDNESS website where I share lots of invaluable information about both spiritual and temporal preparedness.